It is time for us as chemistry teachers to move beyond the Le Châtelier Principle as justification for why disturbances to equilibrium systems cause particular “shifts”. I came across the idea of ditching Le Châtelier in an article by Eric Scerri for the Royal Society of Chemistry in which he summarizes the shortcomings, and outright failures, of the principle. He expands on this idea in a post on his blog. I suggest you read both of these articles in full, as I will only summarize Scerri’s key points. I will then focus on how I approached equilibrium in my class this year to give my students a more rigorous understanding of the concept that can be more broadly applied. The Le Châtelier Principle is generally stated along the lines of: “If a system in a state of equilibrium is disturbed, the position of equilibrium will shift in order to counteract the change”. Other terms used in lieu of “counteract” are “oppose”, “relieve”, or “reduce”. My immediate problem with this statement has always been that it is teleological. That is, the explanation for why the phenomenon occurs is the existence of an intrinsic nature for it to occur: the shift in equilibrium happens in order to restore equilibrium. This often lends itself to personification, “the system wants to restore equilibrium” or “needs to restore equilibrium” and other such appealing, yet fallacious statements. A priori arguments justifying the change based on the result should be replaced with a more rigorous a posteriori logic based on the value of the reaction quotient, Q.
Scerri points out that the Le Châtelier Principle accurately predicts shifts in only one case: changes of concentration. In the cases of pressure and temperature changes students can use sound judgement and come to incorrect conclusions. Consider a system at equilibrium is contained in a closed vessel. The volume of the vessel is reduced. A student could soundly reason that the reaction would counteract the change in volume by shifting to produce more gas so that the volume increases. This counteracts the change, but of course is incorrect. The system actually shifts to produce fewer gas particles. I agree with Scerri that a principle that fails two out of three times should be abandoned. What follows is how I went about this in my AP Chemistry class this year. In this post, I will discuss concentration and pressure disturbances to equilibrium. I will address temperature disturbances in an upcoming post. I do not cover equilibrium in my first year chemistry course, so this is my AP students’ first exposure to the topic. This comes immediately after we have studied chemical kinetics. The first activity I do is a variation on a common activity with bingo chips in which students simulate different equilibrium systems.1 From this activity, students uncover the meanings of dynamic equilibrium, the reaction quotient, the equilibrium constant, and the effects of adding or removing reacting species from an equilibrium mixture. Following this activity, we summarize our findings in a class discussion and briefly review notes on equilibrium and the relationship between Q and K. Then, students complete the new AACT Simulation as a homework assignment to build their fluency with Q and K.
The next class I present the students with two equilibrium systems with discussion questions. 1. If additional Cl- ions were added to the system, would the rate of the forward or reverse reaction increase? 2. If CuCl42- is added to the system, would the rate of the forward or reverse reaction increase? Following the discussion, I demonstrate this for my students by adding 12 M HCl dropwise to a test tube containing 0.5 M CuCl2(aq). The solution turns a bright yellow/green color, confirmation of their prediction. Then I ask them the “challenge question”: if the system is diluted by the addition of water, will this affect the equilibrium position? If so, will the rate of the forward reaction or the reverse reaction increase? They correctly concluded that the value of Q would increase regardless of the actual value of K, so the reverse reaction rate would increase and more reactants would be produced. 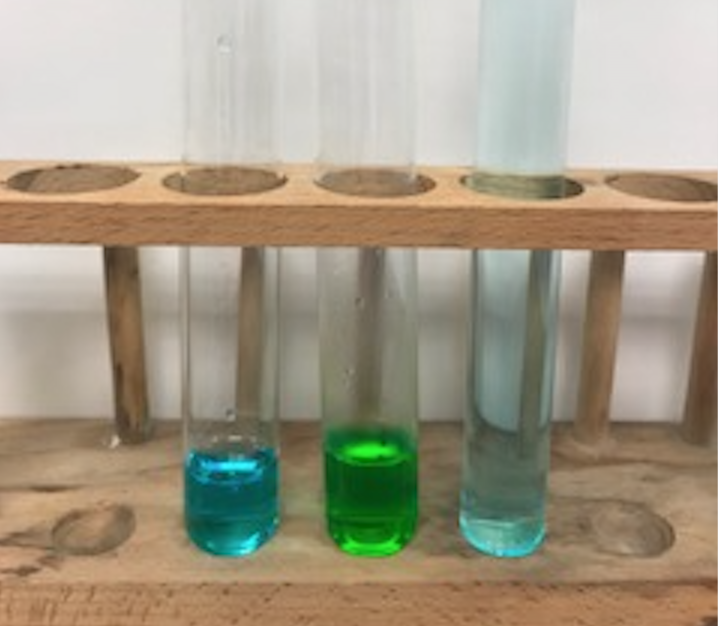 To see if they are correct, we use a wash bottle to add water to the green/yellow solution from the first demonstration and they observe that the solution turns back to blue/green, evidence that the reverse reaction has increased in rate to produce more Cu2+(aq) ions. Then we turned our attention to System 2. Q is now greater than K. Therefore, the reaction will proceed to produce more SO2Cl2(g). The students tried to solve a problem based on knowledge they already had about the reaction quotient, and came to the correct conclusion. Using the Le Châtelier Principle, using their previous knowledge could lead them to an incorrect conclusion, but using the reaction quotient, they will be correct. For AP teachers, this approach would have made approaching the notorious 2016 Free Response Question #6 much easier. Part (b) of this question asks about the effect of dilution on an aqueous system, the mean score was 0.45/4, and the modal score was zero. I hear many AP teachers say that Q vs. K arguments are now “in vogue”, as if with resentment, but these arguments represent more logically sound chemistry. Isn’t that what we all aspire to teach? 1 My activity is based on “Penny-Ante Equilibrium” from Flinn ChemTopics Volume 15: Equilibrium. You can find it below under Supporting Information. Hi Kaleb. I enjoyed this article. It gave me a lot of new things to think about regarding the principle of Le Châtelier (POL), especially your point that “My immediate problem with [POL] has always been that it is teleological.” I’ve not heard that argument before. I have been familiar with Eric Scerri’s work on the POL for quite some time, mostly because I happen to be of opposite opinion: I like the POL. (In fact, I’m not convinced that the POL leads to erroneous results when it is correctly applied and pertinent assumptions are made clear). We can talk about the validity of the POL if you’d like, but I’d actually prefer to move away from a discussion of whether POL is correct or not to something a bit deeper (for now I will begrudgingly grant for sake of argument that POL can lead to erroneous predictions). The point I’d like to claim is that it is sometimes okay to sacrifice rigor – and even truth – to enhance student understanding. In my opinion, if a principle, model, or rule is correct more than 90% of the time (or under certain conditions), then I’d say it is okay to use it with students. I would also say that such “partially correct” principles, models, and rules often create a scaffold onto which further student learning can be built. A few examples of these “partially correct” concepts include the ideal gas laws, the Bohr Model (this model is wrong 118 out of 118 times), and Newtonian physics. I happen to think that the POL –whether it is 100% correct or not – when appropriately presented is a good qualitative principle that helps students predict outcomes when a system has been bumped out of an equilibrium state. The last couple of years I have taught with high performing students at a private school and I do not doubt that this colored my experience with the approach I took this year. My AP students soaked it up like a sponge and moved on. I did introduce my students this year to POL, it is too prevalent in common chemistry parlance for me to not teach them the terminology. But I was in a fortunate position where I could discuss with them its shortcomings, as I see them, and how to best justify written explanations. I think the Q v. K approach is more rigorous, but that does not always mean it is the best approach for every group of students. I think it is a good conversation to have: to think deeply about what models/principles we use and when we use them. And, like you said, POL can be a good building block and will not ruin students’ chemistry education. I like how you use the demo with the reaction to show whether students predicted the correct result or not. I will definitely try it in class. But regarding Le Chatelier principle, I never encounter the "problem" you mentioned. Maybe the way I presented to the students was a little different. I like to use the "see-saw" analogy when I present Le Chatelier's principle. In an equilibrium reaction, if the concentration of one of reactant is increased, the see-saw would go "down" on the reactant side. Then I ask the students, what action needs to be taken to make the see-saw horizontal again? Students would correctly predict a forward reaction, therefore, increasing concentration of product. If temperature or heat was involved, I ask the student to treat heat as part of equation. Endothermic the heat is on the reactant side, and exothermic the heat is on the product side. Thereby, when heat is added, depending on where it is in the equation, the see-saw method still works beautifully. In the case of gases reactions, where the reaction has a 2 to 3 mole ratios between reactant and product, an increase in pressure would enocurage the system to "do something" to relieve the pressure, so student would accurately predict more reactants are produced. I do want to thank you for pointing out something I did not know was a problem, and so that could help me in addressing student confusion better. When applying the principle of Le Châtelier (POL) one needs to keep in mind the "system" being discussed. Increasing the pressure on the system (reaction chemicals) leads to the system shifting to reduce the pressure on the system by shifting the reaction toward the side with fewer moles of gas. One must focus on the system of interest in thermodynamics all the time - same for POL to get sensible results. I think Eric Scerri is just playing with some semantics. POL works when done correctly - just like thermodynamics. Done incorrectly neither works. Really glad that Kaleb brought up this discussion as it's one that I've wrestled with for some time and thought in many conversations with my colleagues that it was more of a personal preference issue than one we should consider as a community. My perspective is informed by the past twenty years of teaching chemistry in high school and college and presently reflects an interest in helping my students use just a few fundamental (or 'threshold') concepts to explain quite a bit of macroscopic and submicroscopic phenomena. I've gotten to the place where I think that understanding a few main ideas in thermodynamics (to predict/explain IF a process will occur under a set of conditions) and kinetics (to predict/explain HOW FAST it will proceed) is sufficient for most of the topics I teach about in my courses. My issue with LCP (sorry, not as fond as Tom of 'POL') is not so much on whether it's 'right' enough of the time to warrant its use in our intro classes (as Tom and , although I think that Derek Cheung has helped me to see how problematic it can be (here, here, and here), but because it's weak on getting to the 'why', which leaves me and my students with only an understanding of 'what' happens, and as Eric S. and Derek points out, not as often as they'd like. The last couple of years I've switched my intro chem curriculum to one developed by Vicente Talanquer and John Pollard at the University of Arizona. As others have pointed out, LCP really doesn’t have any theoretical basis to it, and so students are left with a heuristic that can possibly tell them what happens but not connect the outcome to any underlying thermodynamic or kinetic principles. I have found that a short introduction to Q vs. K, and how the standard free energy change (dG0) relates to the free energy change (dG) is sufficient to explain how systems at equilibria respond when perturbed under isothermal conditions. The van’t Hoff equation is equally straightforward, and although not explaining WHY the endothermic process is always favored at higher temperatures, at least provides a mathematical basis for such an outcome. I am now persuaded that by the intro college course, students should be ready to move beyond simple rules, tricks, and mnemonics to grasping threshold concepts that explain and predict a wide range of physical and chemical phenomena. This means letting go of using LCP in our teaching, even if it’s so entrenched and familiar to us as a community. Thanks for joining the discussion, Greg, and for the links to the articles by Cheung you included. I look forward to reading them! Looks like I've got some homework to do. I'm going to try to read some of these articles this week. If you have any thoughts on them, please share! An elegant way of introducing Q and K is started by drawing a simple horizontal line. Set at its center the value of K and label it as such. I will illustration using the value K = 100. Compute the value of Q. Place it on the number line relative to K: to the left if smaller, to the right if larger. The number line does not need to have any other values on it. I will illustrate with values of Q = 25 and Q = 250. Place arrow, tail at Q and head at K (pneumonic "head to K"). The direction of the reaction follows the arrow from Q to K. Easy-peasy. Top example shifts to products, the bottom example shifts to reactants. Never in 30 years of instruction have so many of my students followed the discussion then correctly repeated it back. Then they were able to use the method correctly in a quiz and an exam. Years of frustration and confusion dissolved in a solvent of understanding. This is a one-dimensional view of an attactor to K. The second dimension, free energy, can be added to begin to explain the attraction. I bring a rope to class, and say I have a 'magic rope'. I hold either end and magically the middle sags. Where the bottom of the rope sits from either end depends upon the relative heights of the ends. I can move the bottom left to right by moving the ends up and down. Any object that can move along the rope, such as a ring, will either be at the bottom or attracted to it. The rope is a simple model of a surface with values of Free Energy vs. Extent of the Reaction. The values of Extent of Reaction map Q. Finding a method to compute Q for values of Extent of Reaction for more than the simplest of reactions is difficult, but unnessary in an introductory discussion of equilibrium in a General Chemistry class. The extent of the reaction has six special positions. The beginning, Q = 0: the rope always sags towards the products. The end, Q = infinity: the rope always sags towards the reactants. The bottom, Q = K: there is no driving force to move away from this condition. Q smaller than K: Q's value increases as the free energy goes down until it gets to K.
K smaller than Q: Q's value decreases as the free energy goes down until it gets to K.
Q = 1: Standard state. If the axes are truly magical, the slope will be the delta G at standard state. In fact if the rope is truly magical, the sign and magnitude of the slope at every point of the Extent of the Reaction wil be the delta G under those conditions. The attraction of Q towards K is a vector with direction and magnitude just like the pull of gravity on a ring on a rope. This vector IS the sign and value of delta G. This does not explain what free energy is but they buy that something energetic can be an attactor and are willing to wait three chapters to find out the enthalpic and entropic source of free energy. I cannot hope to manufacture this magic rope, but any string, hose or cord would do as well to demonstate. I had a difficult time drawing a curve that would match the slope between the Extent = 0 to Extent = 1 and a point in the middle. Thus Q =1 does not sit off of the middle in my illustration (Which I would be glad to post if I could figure out how to do it.). Though such a rope does not exist these simple one-dimensional and two-dimensional illustrations help students to frame the idea of equilibrium in a correct, albeit only semi-quantitative, manner. Note: Temperature can be a third-dimension which could be illustrated by using the magic rope as two-dimensional slices where the relative heights of beginning and end change with temperature. If anyone can do this without using -TdeltaS, I would be glad to hear it. Joseph, I absolutely love the visual you've described here. I've shown my students various graphs similar to this that represent Q, K, G, and Eo but I like how the rope is movable and less intimidating than what one of those traditional graphs looks like. I am going to think on your last point about how to demonstrate temperature. We discussed Q v K back in December, but I am going to try this when we get in to electrochemistry next week.